I’m always hesitant about Japanese food in the city. There are a lot of Japanese restaurants out there, and majority of them I am not often too impressed with. Either the quality of fish is lacking (reflective in the price), or it’s so expensive that I wouldn’t dare step in (i.e. 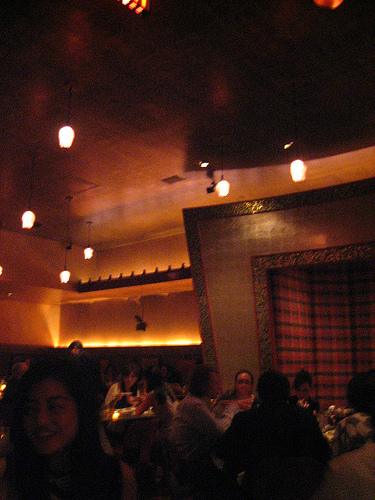 Maru, 15 East, Blue Ribbon Sushi, the list goes on…) so it leaves me at this weird middle place about Japanese. Then you bring on FUSION. I’m always hesitant about this idea of fusing two different cuisines. It’s hard to master one cuisine, not to mention incorporating another one…can a restaurant really do that well? I always see fusion = japanese + chinese + korean = not good. 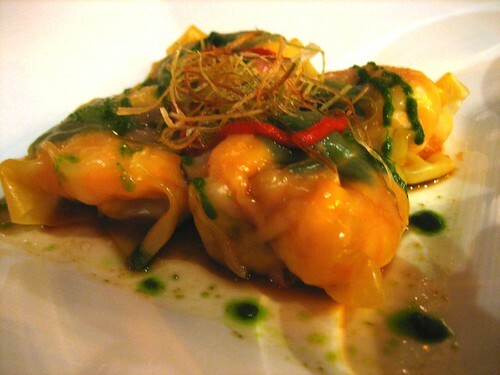 This is Steamed Homemade Prawn & Vegetable Dumplings flavored with oil. Though there were only a few dumplings, it was really good – they definitely used fine ingredients. The prawns were large and the skin was silky smooth. It was slightly spicy, but not overwhelming in flavor. This is their Egg Custard “Chawan-Mushi” with Lobster Sauce. It was a new take on the traditional Japanese egg custard dish that is often eaten as an appetizer and has a soft silky texture. 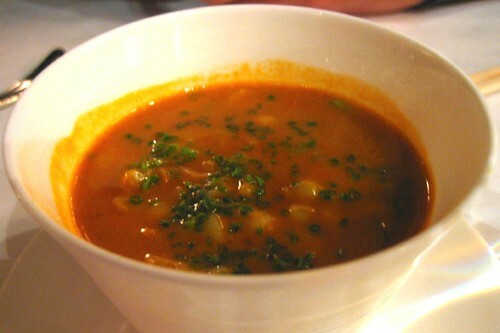 They added a lobster sauce, which worked very well with the egg custard. You could taste the lobster as well and it added another layer of flavor to this dish. 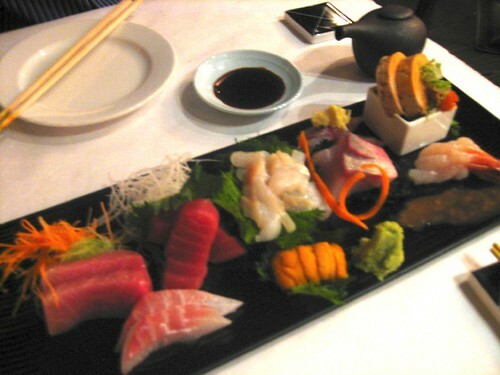 We deliberated for a while which sashimi plate to get – chef’s selection or the normal selection? CHEF’S SASHIMI SELECTION! Boy, was it good. It was like a trip around the world because they had fish imported from Japan. The cuts were fresh and meaty…I felt like some pieces even melted in my mouth. 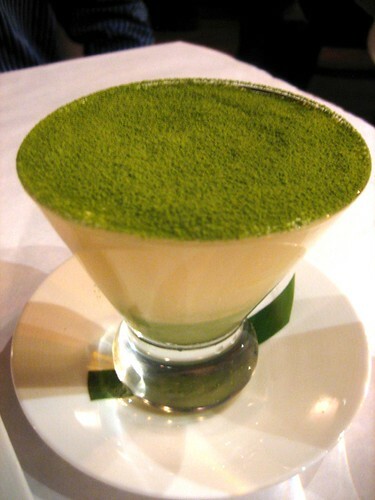 This is the Green Tea Tiramisu dessert. As you can see, it is covered with matcha powder. The combination was surprisingly good and didn’t clash. 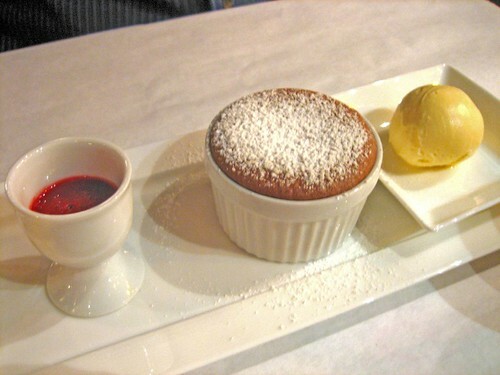 Shown above is the Chocolate Souffle, Raspberry Sauce, and Vanilla Ice Cream. It is REALLY good…namely because I also love desserts that incorporate both cold and hot elements. The combination of all three – chocolate, vanilla, raspberry – made this a delectable dessert. Conclusion: My experience at Lan has been one of the most memorable Japanese dinners I’ve had. One dish that I didn’t show above was the prime rib shabu shabu. Our waiter was so helpful too, even when it comes to picking sake! He gave us a sampling of three sakes and it was delicious with what we ordered. Yum. I give this meal and restaurant a HUGE thumbs up!